How much is a hamster running? This page is dedicated to Maszat, my long-haired golden syrian hamster and his performance on the running wheel. 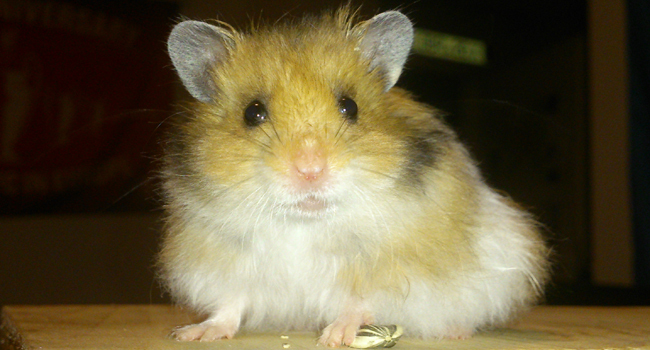 Hamsters are very active animals, in the wild they spend most of their awake time running, gathering food and digging. So a hamster is naturally programmed to be energetic and this doesn't change if you put them in a cage neither. Given an exercise wheel, most probably they will spend a lot of time running as far as they can get (at least in their mind).They are nocturnal beings, so they spend almost all of the daylight period sleeping and start being effective when the sun sets. I had the desire to track the achievement of a hamster for a while ago, back when I still had Blöki (my previous hamster). He passed away meanwhile, and getting a new company was a good occasion to implement my plans.